As some of you know, I work for Pinterest. This is amazing for multiple reasons – one of those reasons, of course, is that I get to be on Pinterest all the time. ALL. THE. TIME. I mean, they pay me to do it. If you’re not on Pinterest, stop reading now and sign up. Life changing, for reals. At this point, my entire Pinterest feed is endless amazing looking desserts, sprinkled with a random rap quote and a cute puppy every now and then. (I love hip hop. And I’ll admit it – I search for cute puppies on Pinterest when I need a mental break at work). “Having” to be on Pinterest all the time now makes me want to bake all the time. While my real jam is baking SUPER dirty desserts (think Oreos on top of cookie dough on top of brownies with ice cream & hot fudge, etc. ), I have turned a new corner. But, I can’t give up the sweets. I just can’t. Why would I? Enter Baking BadAsh. A blog dedicated to my pursuit of taking normally dirty treats and turning them clean. 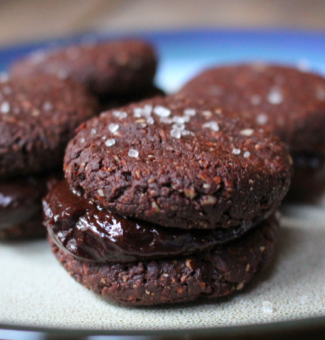 Recipe number one happens to be easy Salted Cocoa cookies. Yes, this chocolate-y goodness below is actually clean & made with healthy ingredients. Indulge now! 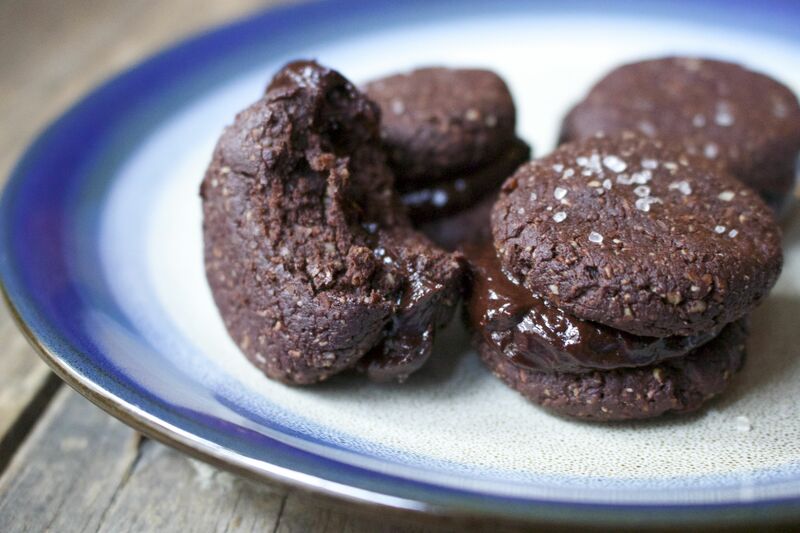 Easy Salted Cocoa Cookies – Clean recipe! Preheat oven temp to 350 degrees. In a medium to large bowl, mix almond flour and cocoa powder. In a seperate bowl, mix together egg, coconut oil, agave or maple syrup, and vanilla. Put in the fridge for a few minutes – it will make it easier to roll into balls if it’s a little chilled. Roll in to balls and then push them on to a parchment paper. Sprinkle sea salt over cookies then bake for 12 minutes. As cookies are baking, star mixing together ingredients for the cookie filling and whip together until you get to a frosting-like consistency. When cookies are done, cool for 3-4 minutes then using a frosting tip, add enough to cookie to create the sandwiches. Eat!